The Samoyed dog breed has a very interesting history. Originally from the primitive Samoyed people in northwestern Siberia, the Samoyed dog breed found his way into modern history by helping explorers in the North and South Poles, as being the pets of the ill-fated Czar Nicholas II, the last Emperor of Russia, pets to Queen Alexandra of England, and rescue from a zoo in Sidney, Australia by the Kilburn-Scott family of England. Most Samoyed dog breeds today descended from the dogs who survived the explorations of the North and South Poles. 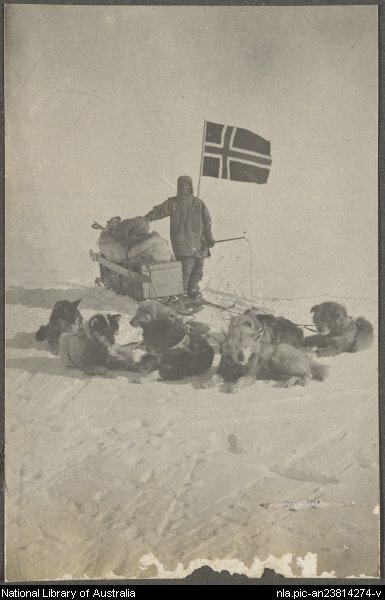 One of the most well-known expeditions was led by Norwegian explorer Roald Amundsen whose Samoyed dog Etah was the first animal to reach the South Pole, followed, of course, by the first man to reach the South Pole. The Samoyed peoples primarily used the Samoyed dog breed to herd and guard elk. However, the Samoyed was also used for hunting and sled pulling. The Samoyed dog breed was a valued member of the Samoyed people’s family. The modern explorers who considered using the Samoyed dog breed due to its more amiable nature than the Husky or Malamute had a difficult time obtaining the Samoyed dog breeds because their owners were unwilling to part with them. The Samoyed dog breed was came to America through the Grand Duke Nicholas of Russia, who was the brother of the Czar. The Samoyed dog breed was recognized by the American Kennel Club (AKC) in 1906. The Samoyed dog breed is a Spitz-type breed. All Spitz-type dog breeds descended from the arctic regions of the world. Like most Spitz dog breeds, the Samoyed dog breed has the short triangular ears and long tail that curls over the back. He also has a thick double-coat which consists of the wooly undercoat and the straight harsh outer coat which stands out from his body. The long hair is more prominent on his tail and around the ruff of his neck. The Samoyed dog breed is distinguished from his light-colored coat. His coat is white in color, white and biscuit, all biscuit, or all cream. He stands about 19 to 23.5 inches tall and weighs between 35 and 65 pounds. The hindquarters of a Samoyed dog breed are very strong. His chest is moderately deep and his legs are moderately long. He has a wedge-shaped skull, dark eyes and a black nose. Another distinguishing feature of the Samoyed dog breed is his “smile”. Known as the “smiling dog”, the Samoyed dog breed’s look goes along with his happy personality. He gets along well with every member of the family, including children. He is good with other pets and good with other people outside the family. Although he is not an aggressive dog, he can make a good watchdog. Like other Spitz-type dog breeds, the Samoyed dog breed can be somewhat independent and stubborn. But this can be easily overcome with proper positively reinforced training and emphasis on his eager-to-please nature. The Samoyed dog breed is playful but relatively calm indoors. He needs regular exercise such as long walks, jobs, or brisk play sessions. 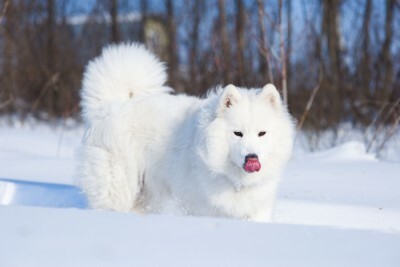 Without proper exercise, the Samoyed may have a tendency to develop behavior problems such as chewing. The Samoyed dog breed also needs regular brushing. His thick coat needs to be brushed 2 to 3 times per day, or daily during shedding season. As with most large breed dogs, the Samoyed dog breed can develop hip dysplasia. And like most deep-chested dogs, the Samoyed dog breed is prone to gastric torsion. The chances of purchasing a Samoyed dog breed that develops hip dysplasia can be reduced by purchasing from a reputable breeder. A reputable breeder will most likely be a member of the Samoyed Club of America, Inc. They will also most likely have already done the testing for hip dysplasia on both parents of the puppies. If you would like a dog who will do well with every member of your family, the Samoyed dog breed may be for you. Be prepared for a dog who needs lots of daily exercise and grooming. Consider adopting a Samoyed dog breed from a rescue group or purchasing one from a reputable breeder. The information that we found on the Samoyed dog breed came from a variety of sources including Barron’s “Samoyeds, A Complete Pet Owner’s Manual”, “The New Encyclopedia of the Dog” by Dr. Bruce Fogle, and Barron’s “The Dog Breed Bible”. For these and other great books on the Samoyed dog breed, visit our Amazon Dog Lover’s Book Store. Dog pack packs, pet life jackets, and more. Fleecy Clean, Kong, Nylabone, Rope Toys, etc. Kong, Tuffy's, Firehose, Bottle Buddies, and more. No-Pull & No-Jump Harnesses, Clickers, Treat Pouches, etc. Dog Sweaters, Boots, & More! FURminator, Bristle Brushes, Rubber Dog Brushes, Rake Combs, etc. Orthopedic, Memory Foam, Overstuffed, etc.